The rides we do and the equipment we use has evolved over time. We also have just biked with the kids in bjorns when they were itty-bitty - although just for beachcruiser-type rides. I am not saying that I recommend this mode of transport, but it is kinda fun. Once my daughter got a little older we migrated to an Ibert Front-Mounted Bike Seat. This is an awesome option because your kid is right there with you and you can chat with them as you ride along. 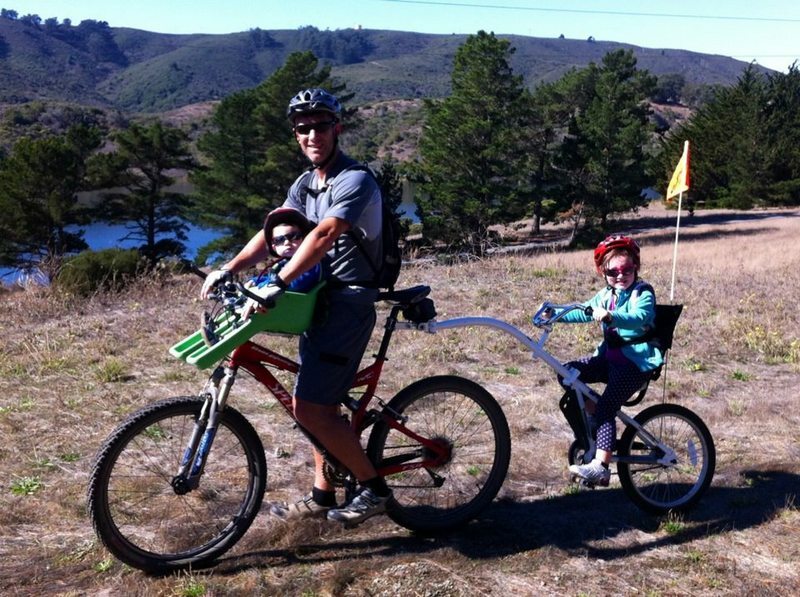 It is also such a sleek and stable arrangement that we have felt comfortable using this set up to even take the kids on mellow mountain bike rides. The other option along this line that I have seen (and seems to actually have some key advantages in that it has a front head rest which allows the child to sleep) is the WeeRide Kangaroo Seat. I saw pictures of kids sleeping in the Kangaroo seat and didn't really believe it (I mean how could a kid effectively sitting on some bike handlebars and zooming along fall asleep with all the stimulus?) but I have now had to jerry-rig a headrest for my son a couple of times when he has fallen asleep on rides and wished I had the WeeRide headrest. Once my daughter turned three, and number two came along, we augmented our ride set up with what we call our “tag-a-long” bike. We love the tag-a-long because my daughter is actually getting great exercise, but more importantly she is getting used to, and enjoying, the sensation of riding fast. She is a very tentative biker on her own and so having her really enjoy the sensation of biking is proving to be an important benefit of having her ride tandem. We have taken her on rides of over 12 miles in length on the tag-a-long and we could feel her little legs pumping the whole time as she chattered away. Biking as a family is something we do from home on weekends and when we are traveling. Because of my aforementioned car paranoia, we always bike on designated bike trails or fire roads and trails. We have taken the kids biking in Tahoe, Kauai, Bend, Santa Barbara, and Sequoia National Monument. Our best rides have been along the ocean where we have watched surfers, dolphins and the waves as we cruise along. A lot of the tips that I mentioned as part of my Group Run post apply to Family Bike Rides. I hope that you are out there doing this with your family or are now inspired to think of this option on your next long weekend afternoon or vacation. If you have recommendations for great rides, please shoot them my way or post them on the MommyTasker Facebook Page so we can all benefit from your knowledge. Pedal on! Please contact me at mommytasker@gmail.com, MommyTasker.com, or connect with me on Facebook. That's so innovative and inspiring to see the family bike ride like this. The trailering attachment is so great. Thanks for sharing.